For years, the theme of the concluding Sunday morning concert at the Tanglewood Festival of Contemporary Music (FCM) has often been “…and on the other hand…”. That is, the pieces scheduled for this 10:00 a.m. event are sometimes rather different from the pieces encountered so far. 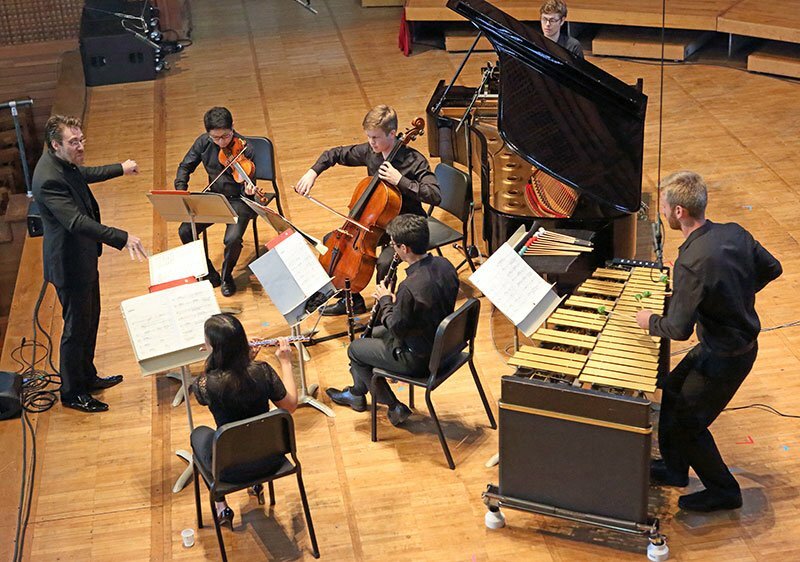 A few years back Pierre-Laurent Aimard scheduled a Festival of often intimidating modernists, but gave Steve Reich’s Music for Eighteen Musicians the entire second half of the Sunday program. This year, the late Steven Stucky’s program isn’t quite so polarized, but the six pieces this morning did stand in opposition to the six encountered on Saturday. Forced to characterize that difference, I would say the pieces Saturday were on the whole more ingratiating and more inviting to the audience. Even Erin Gee’s unconventional mouth sounds were easy to appreciate as odd virtuosity. The works Sunday were often a bit tougher to crack, but they were in the main more engrossing. At least to this listener. The other thing that seems to happen is that scads of people are bussed to this concert. Even I cannot believe there are busloads of contemporary music admirers wanting to hear a morning performance, and I wonder if the older man whose grumpy “Thank God!” punctuated his early exit had been transported by bus to Ozawa Hall. The first piece might be an exception to my forced dichotomy of “ingratiating” vs. “interesting”. Dense and hyperactive, Anders Hillborg’s (b. 1954) Brass Quintet strikes me as digestible and fascinating to anyone who is familiar with the Rite of Spring, though the techniques employed here are rather different. In this piece Hillborg layers his materials right on top of one another, with just enough time to let the brain register them. They recur often enough to alert the memory, and they have a tonal core to them though their layerings are often dissonant. At crucial moments the music thins out to a single rapidly repeated pitch, tossed around the ensemble, giving the listener a chance to catch their breath while never dropping intensity. The rapid overlapping and intercutting of the music provides a sense of compositional virtuosity, while the athleticism of the figures demand actual performing virtuosity from the players. Exciting, engrossing, and well-proportioned, the work was especially welcome because it brought brass instruments to the chamber music stage in something other than incidental roles. It was important to be reminded that there are exciting and astonishing young players using instruments not present in Pierrot-derived ensembles. Tanglewood Music Center Fellows Priscilla Rinehart (horn), Elmer Churampi and Anthony Limoncelli (trumpets I and II), Kelton Koch (trombone) and Joe Lefevre (tuba) played with ease, aplomb and brilliance. After that, it was five works for ensemble that were, yes, Pierrot-derived: they all included piano, flute, clarinet, violin and cello, some with additional strings and percussion. They were all mostly modernist in bent—by which I mean they eschewed overt tonality and often played very free with dissonance. But the grouping comprised great variety. Brett Dean (b. 1961) is an Australian composer whose calling came relatively late, eventually leaving a post as violist at the Berlin Philharmonic (!) to concentrate on composition. His Sextet (Pierrot plus percussion) carries a subtitle, “Old Kings in Exile”, that refers to a memoir by Arno Geiger about Geiger’s father’s decline from Alzheimer’s disease, an extra-musical reference that seemed to have at best a passing relevance to the piece, which seems quite easy to take on its own terms. It is built in three movements in a slow-fast-slow arch, dominated by the large middle movement. The slow movements are ghostly and nocturnal, where lonely twelve-tone melodies hang suspended over guttural rumblings from the bass drum and spectral gong-scrapings. That melodic material is just barely recognizable (at least on my first hearing) in the big second movement, which is build out of cascades of collapsing scales and nested triple-time rhythms, holding at its center a haunting flute melody blurred with flutter-tonguing. The last movement is similar enough to the first to sound familiar, yet changed by what has gone before. A long solo in the piccolo, which recalls the flute but with a slightly hollower, more impersonal sound, hints at what that change might be. It engages the intellect architecturally and the moment, while inducing an emotional reaction and sense of journey difficult to put into words. The late Jonathan Harvey (1939-2012), a modernist of the late Stockhausen bent combined an enthusiasm for the austerities of Darmstadt with a devotion to Eastern philosophy. Matthew Mendez’ program note catches the flavor of this combination beautifully by quoting Harvey declaring that “spectralism in its simplest form as color-thinking, is a spiritual breakthrough.” This makes it possible for him to write his four-movement Song Offerings using the fragrant poetry of Rabindrinath Tagore, but to be able to write about the “acoustic formant” of the word death in the final song that permits him to set it so that “syntax, spectral acoustics and poetry are inextricably linked.” If you say so. I can’t say that this linkage was audible, or that any breakthroughs, spiritual or otherwise, were experienced by the audience, but I can say that it was a nice occasion to be re-introduced to soprano Sarah Tuttle, who I heard at last year’s FCM. On that occasion she struck me as fresh-faced and engaging; a year later, her voice has darkened attractively and gained dimension. The po-faced seriousness of the music felt limiting, though she was able to spin some fire into the occasional extended melismas Harvey threw her way. There’s some nifty tone-painting here, to be sure, which makes full use of the extended Pierrot ensemble (adding a second violin, viola, and bass). The change from the sleep of the first song to the waking of the second is vivid, and there were unexpected timbres of music-boxes and wind chimes in the final poem, a sort of epithalamium to Death, but I felt I was hunting for virtues during much of the piece. Pierre Boulez, who died early this year received his one fitting and satisfying tribute at the FCM with his Dérive 1 from 1982. Only seven-minutes long, for Pierrot plus percussion, it is filled from start to finish with resonance: from held strings, piano sustain, and trilling woodwinds. Its taut, closely argued, and demanding of (and repaying) attention. Dérive 1 also calls to mind Debussy from its first notes, and can be parsed by the listener as a dialogue between the piano and clarinet. The other instruments provide commentary and atmosphere in an environment that changes and evolves constantly in response to that dialogue. If one had been fearing rebarbative Boulez, this must have come as a pleasant surprise. Franco Donatoni’s (1927-2000) career was troubled. Early on he wrote difficult and challenging works drawing on ideas from Darmstadt and Cage. He referred to this as his “negative period.” Arpège (Pierrot plus percussion) comes from his second, “joyous” period, which was extremely productive. He still stuck to his old roots, using “codes” into which he fed material to create his music. This process is very audible in Arpège, which is a series of episodes built on a steady rhythmic pulse. The principles underlying the pitch organization are anybody’s guess, but interest is fully held through the changing colors and textures, both rhythmic and timbral. There’s always something to hold on to, though never one thing for very long, and there’s a steady parade of variety. But while its local organization is unified, there’s an arbitrariness to its architecture, no audible plan to explain its scale. It suddenly starts, changes entertainingly throughout, and ends. It is a perhaps unusual object, a work built on modernist principles but whose purpose seems only be to pass the time entertainingly. I enjoyed being in its company, and it did not overstay its welcome. It is stretching definitions to call Harold Meltzer’s (b. 1966) Variations on a Summer Day “Pierrot”-like. In truth, it matches the instrumentation (two flutes, two clarinets, piano, two violions, viola, cello) of Ravel’s Trois Poèmes de Stéphane Mallarmé, one of the conditions of its commission from the Fromm Music Foundation. Meltzer also chose to set poetry, in this case the eponymous poem by Wallace Stevens. It began life as a setting of eight of the brief stanzas of which the poem is composed; the version presented at the FCM contained double that number. Sixteen is a lot of miniature songs, and it would double the length of this already verbose piece to comment on all of them. Stevens is a dangerous poet to set to music. There are many ideas at work, and his syntax is often challenging (I doubt anyone can make “The Arachne integument of dead trees” work effectively in a song.) To bring this text under his control, Meltzer employs an array of strategies, with both successes and failures. He uses music to mirrors images in the music, conjuring astonishing gulls at the start. He also dutifully supplies piano music on the line “improvises on the piano.” There’s dramatic invocation, from marvelous, soaring, restless a capella melody on the ninth stanza, “This cloudy world,” to a weirdly demanding interpretation of “Cover the sea with sand rose.” Mezzo-soprano Quinn Middleman was extraordinarily well-suited to this project. Although at first appearance she seemed merely a round-faced, cheery presence, her voice was commanding and direct, and her personality sly and even a little seductive. Stevens’ more archaic lines were occasionally enlivened with a sideways glance or half-smile, as if she were pleased by its cleverness. And while the setting of “Cover the sea with sand rose” was much too intense for the text, I had no question I would obey her if she demanded it of me. Somewhere in the low teens of settings my mind wandered from the music, but it only wandered far enough to focus on the interpreter, a pleasant way to end this late morning. The Dean and Harvey were conducted by Nuno Coelho; the Boulez and Meltzer by David Fulmer; and the Donatoni by Christian Reif. There were too many performers to list for each piece after the Hillborg. A total of 25 players appeared on stage: 22 TMC Fellows and three guest artists, not counting the conductors or the members of the brass quintet, who were mentioned above. The playing was on the uniformly high level I’ve come to expect from the FCM; of particular note was the effortless technique demonstrated by all of the young players, and the clarity and transparency of sound achieved by the conductors. The FCM contains what is certainly the most difficult and challenging repertoire heard during Tanglewood, played with excellence by the youngest artists. For anyone who values the music of our time, this has to be tremendously encouraging. One exhausts one’s vocabulary of praise for their achievement.